Twitter is a great way to learn English in small doses [amounts]. Because the maximum post can only be 140 characters, it’s much simpler than reading a long text. By following a lot of English Twitter accounts, every time you log into Twitter, you’re bound [sure] to see a lot of great English tips in your feed. If you have a smart phone, whenever you have downtime [when you have nothing else to do, like waiting in line], you can quickly open up your Twitter feed and practice a little English. When learning any language, it’s important to practice and condition your brain to the language every day, even if it’s just a little bit. Remember, just a few minutes here and there will really add up over time. And Twitter is an easy, free way to get bite-sized [small, short] English tips. As was previously mentioned, tweets are short. So what can you learn in 140 characters? What English Can I Learn with Twitter? Listed below are some examples of tweets you can find on the Real Life English Twitter feed every day. PHRASAL VERB—Chip in: help. Example: If everyone chips in we can get the kitchen painted by noon. VIDEO—What are people saying about Real Life English? As you can see, there’s a ton [a huge amount] of English you can learn in such a small period of time. Besides these English tips, RLE also tweets our articles, our podcasts, TED talks, and other random English tips. But we’re not the only Twitter account out there! Different people tweet different things, and you can definitely learn all kinds of valuable stuff on Twitter. 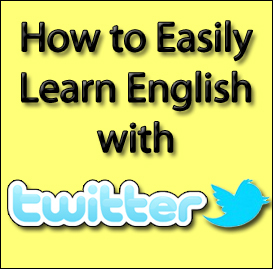 Creating a list of Twitter users specifically for English will greatly help you to focus specifically on learning English and keep you from getting distracted by other tweets. While this is great for all different types of users, it’s especially helpful for people who are following lots and lots of people. If you don’t know how to create a list, check out the image below. From here, you can either create a new list, or add the person to an existing list. So now that you’ve got a list set up, it’s time to follow some awesome English tweeps [Twitter people]. If you haven’t already, be sure to follow @RealLifeEng. NOTE: We tweet A LOT. That’s a lot of extra English learning! Which people you like will depend on your personal tastes, but check out their tweets, add them to a Twitter list if you like them, check it out many times a day, and I guarantee your English will greatly improve! If you know of some other great English accounts that I didn’t add, please post them in the comments below. Real Life English is all about learning English in a fun, relaxed way. We enjoy showing how you can use technology to greatly improve your English. To learn more, download the free PDF report, The Top 5 Tools/Resources For Learning English Online. Great article, Trevor! Keep it up!